"We went eyeball to eyeball and the other fellow just blinked." On October 14, 1962, an American spy plane spotted a Communist missile base under construction in Cuba, ninety miles from the United States. The discovery triggered an open confrontation between the world's two great superpower, the US and the Soviet Union. For thirteen days, the world held its breath, waiting to see if brinkmanship and manoeuvring led to a peaceful settlement or World War Three. As Kennedy or Khrushchev, can YOU win a decisive political victory or will you be remembered as the leaser who plunged the world into atomic war? 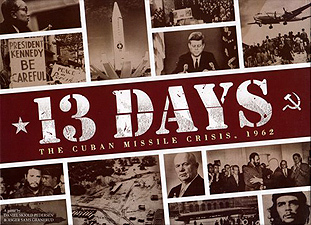 13 Days is a card-driven boardgame of the Crisis with player staking the roles of the two superpower leaders.